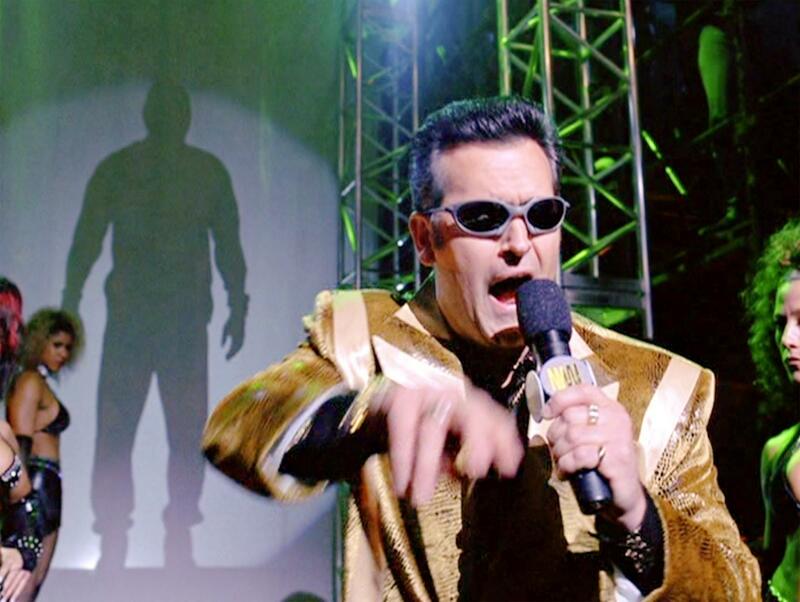 Actor Bruce Campbell has been keeping very busy these days. He’s serving as a producer for the new Evil Dead reboot that will be hitting theaters in April 2013, he can be seen in the hit USA Network TV show Burn Notice, and he’ll be at San Diego Comic-Con 2012 signing autographs at the Activision booth for his role in The Amazing Spider-Man videogame. Campbell took a break to talk about going virtual in Spider-Man (again), and why even bad versions of Evil Dead: The Musical are good in this exclusive interview. What character do you play in The Amazing Spider-Man game? I play an amazing character in the Amazing Spider-man. I’m a former extreme sports guy who has now got into promoting, sort of like Ryan Seacrest…but he’s crazier than Ryan Seacrest. He’s pushing Spider-Man to do his best stuff. So my job is to be the pivotal character in the entire game. They call your character “The Extreme Reporter.” Having dealt with reporters for a long time what was it like to actually play one? It was great because I made them look like jerks. Now what are your thoughts on Stan Lee being a playable character in this new Spider-Man game? I’m a little pissed off because Stan is now I think 700-years old and I am only 90-years old. So I’m a little pissed that he can do stuff, but I’m the guy in the blimp. When will be we seeing a Bruce Campbell character in one of these Spiderman games? You won’t because Stan Lee apparently contractually is terrified of me and makes sure that I cannot be played while he is played. Stan gets to be the man. Do you keep him out of the Evil Dead videogames as well? Is that how it works? Well, in the Evil Dead games no one can do anything except me. I do everything cool. Everybody else is a fool. What do you think of how far these Spider-Man games have come since you first got involved with them? Every game, every year is better. You know it’s all about resolutions. It’s all about storage memory. It’s all about trying to create real atmospheres. Movies are becoming videogames. Videogames are becoming movies. Everything is reaching a new plateau of crazy ability. The whole web swing, all the free-styling Spider-Man stuff, that’s all because of technology. So some 10-year-old kid will never know that there was a game called Pong, the worst game ever invented, which I played in 1973. These kids can now swing through every single block of New York City, flipping, turning, grabbing. They have no idea how far that we’ve come. Do you go in and play the Spider-Man games? No, because I can’t. I have no idea how to do it. I can play Pong. I have one – it goes up or down—I have forty seconds to decide. I can watch that thing coming at me for like half an hour and I can get it, but then I progressed to other games. Asteroids was a very good next-level game and Berzerk. So I’m still way behind. My son’s a full-on gamer, but I’m a flamer. I can’t do it. I flame out. These Evil Dead games. I can’t beat Spider-Man. I can’t beat any of these. Some of those classic games are now available on your smartphone or tablet. Yeah. Of course. They’re pretty popular – too. Spider-Man and Evil Dead are on there too. You know I’m huge into games as long as I don’t have to actually play them. That’s a good thing about a game like Spider-Man because it’s actually fun to watch somebody play. Yeah. Because every year there’s some improvement. You know it’s funny, I’ve done two different games, where by the time I voiced the games, the (console) platform was no longer valid. That’s how fast it was changing. So I’m like, “Wow.” You can’t keep up. People are always asking me to do voices in videogames and pretty soon that’s all there’s going to be. What do you think of The Amazing Spider-Man game serving as an epilogue to the big screen reboot? Why would you not want to do that in this age of everything being connected? I mean the word “synergy” is the key of the decade. Once the movie comes out, watch the movie. Oh, my god there’s the game. Oh, my god it’s like the movie only better. So now you can do it your own way. I think it’s absolutely the way that modern day advertising goes. My dad was a mad man in Detroit. He would have appreciated everything done to promote a game these days. You have to have a Twitter handle and Facebook page. You have to have a hash tag or you’re nobody. What are your thoughts on the opportunities games open up for actors today? I give a lot of credit to any of these men and women (voice actors) who work on games because I’ve done enough games that I know you have to do a lot of work. When they put the stack of paper in front of you to record, it’s like an inch thick. It’s because in the game if the guy just stops at the door, what do you do? You have to say, “Get away from the door. There’s nothing there.” But that’s only if the guy stops at the door. That’s one and one hundred chance, but you have to record it. I think the guys who do games should be applauded, of course. Comic Con is around the corner. What role have you seen video games play at the Con over the years? Very huge because a lot of movies are coming from games now, whether it’s World of Warcraft, or Resident Evil. They’re making games into movies because of the numbers. Call of Duty makes over a billion dollars. It cost a lot less to make Call of Duty and it ends up making the same amount as Avatar. I’d put my money in gaming. They’re blending. You can’t tell the difference anymore. Do you have plans for Comic-Con this year? There’s always two or three reasons to go or not go. 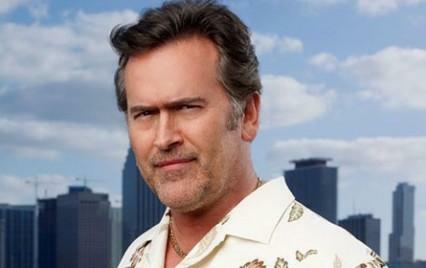 This year Burn Notice will not go this year and the Evil Dead remake isn’t going to happen. Maybe the Spider-Man autograph session. I’m not really sure. What are your thoughts on the Evil Dead musical? Oh, it’s fantastic. I’m off Broadway and I’ve seen it in Fresno, California, and Bend, Oregon. The best news about the Evil Dead musical is it’s done really well. It’s incredibly entertaining, and if it’s done poorly, it’s incredibly entertaining. You can’t lose. It’s the type of show where the first three rows are just splatter zones. To stage that thing, limbs are being cut off and the blood is going to go 18 feet. I’ve seen some of the shows where it’s impressive as hell. Would you like to explore more Evil Dead video games? Maybe. I did three Evil Dead games and they grew from the technology of the day. By the time we got to the third game, I thought it was a good game. The first two were subject to the same technology limitations as the other one. I think a new series of games would actually be fun because you would take the new technology, and the remake is coming out April of 2013. What are your thoughts on the Evil Dead remake? Look, we’re all over it. Sam Raimi, Rob Tapert, and myself and Lab Chafford were behind it from the beginning. Sam Ramai handpicked Fede Alvarez to direct it. Diablo Cody hit a path for the screenplay. I think it’s an incredibly solid, adult, shocking cool horror movie. I just recently saw the rough cut. We’re 100-percent behind it. There’s no descent. We can’t wait to scare the crap out of a whole new generation of audiences. They have no idea what they’re about to see.